Bail Bond Company Reviews | Google, Yelp, Superpages etc. Remember, searching bail bond company reviews is a great way to find out about a company’s service before hiring them. At Signature Bail Bonds, our reputation is EXTREMELY important to our entire staff. 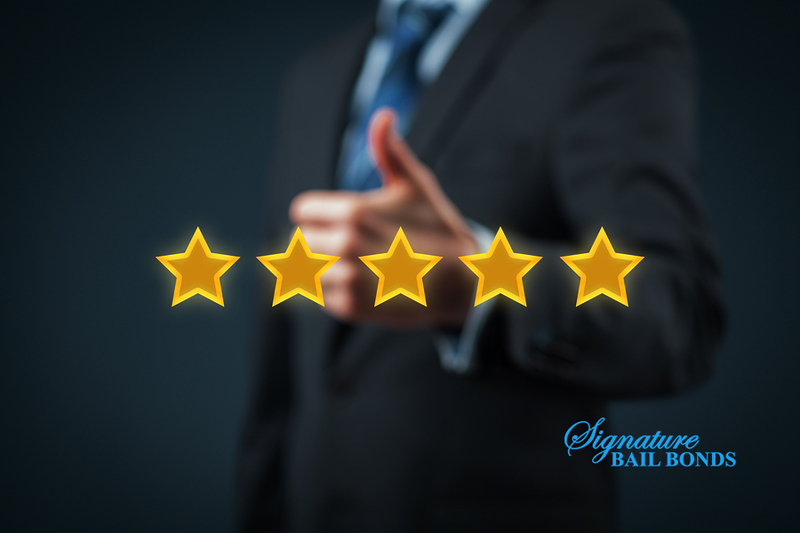 Our bail bond company works hard to earn a five-star review for each and every online review. When you need a bail bond company quickly, you want to make sure that you work with a reputable, knowledgeable company in order to get your loved one out of jail. Reading through bail bond company reviews can help you make your decision. Once you hire a company, consider posting your own bail bond company review. Your feedback may help someone else in the future. When a loved one has been arrested, one of your first tasks will be to find a bail bond company. With all of the information available on the internet searching for bail bond company reviews will yield more results than you need. We suggest simplifying your search with a review site such as Yelp or Google. Searching bail bond company reviews is a good way to find out more about a company. However, sometimes reviews are published unfairly. Many have even found that competitors have posted fake reviews. An Oklahoma bail agent is required to hold our clients accountable to the court and our judicial system. Unfortunately, a client or family member may be upset that we have to return a defendant to custody for FAILURE TO APPEAR as ordered by the court. Even when this type of situations arises, we ALWAYS remember the golden rule; treat others as your would want to be treated. Doing a Google search for Tulsa bail bond reviews yields about 155,000 results, which is more information than you are looking for in your time of need. In order to find a bail bond company more quickly, you should use sites that are designed to provide real reviews based on a certain service area. Yelp presents real reviews from real people when searching Tulsa bail bond reviews. Yelp reviews are submitted by users based on their experiences. If you search bail bond company reviews near Tulsa on Yelp, your search will yield 6 results. With just 6 results, you can narrow your choices down to a few companies. One you read through the reviews on Yelp, you may want to cross check reviews on other sites like YP, Superpages, and Google by typing the company’s name on those websites. Read through each review carefully in order to make your decision.